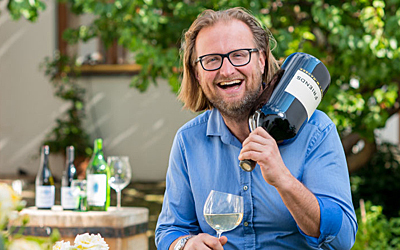 Synopsis, Our Opinion: A mediocre Grüner Veltliner. Geographic Appellation,, Region, Country: Weinviertel, Austria. Paired With: Turkey with orange sauce, sweet potatoes, sausage dressing and corn on the cob (from the garden). 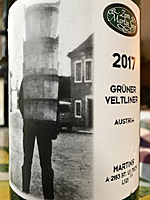 In August 2018 we had a bottle of Huber Grüner Veltliner 2017 and thought it was such a good value we immediately bought all the Caviste Wine Shop had in stock and ordered more. After having it several times we thought it was such a spectacular value we would buy several additional cases. Unfortunately other people also thought it was a good buy (or they read the glowing TastedOnline.com review) and the distributor didn’t have any left. However we were told there was another producers Grüner Veltliner available in 1 liter bottles and at the same price. We ordered a bottle without hesitation and this is the review of the “replacement” wine. Chilled before drinking. Clear, almost colorless except for a slight green tint. Faint lemon citrus aroma. Intense mouthfeel, dry, light body and a 200-grit texture. Feeble flavors of tart lemon, California grapefruit and apple. Overpowering zippy acidity and a lively tart lemon and lime tasting finish that ends with hints of mineral. Although our pairing may not have been “perfect”, the wine just wasn’t what we expected. Both the aromas and flavors were muted and the acidity so dominated the taste that it was abhorrent. In the end it wasn’t nearly the quality of the Huber and even with the low price it was just a mediocre Grüner Veltliner. Note: The Huber Grüner Veltliner was our selection for the best value wine in 2018 so it was a tough comparison for this Martinshof Grüner Veltliner!!! Michael Martin at his winery in Neusiedl/Zaya, Austria. Comments: Learn more about Weingut Martinshof and their wines. Imported by: Carlo Huber Selections; Salisbury, Connecticut.